Great article about Wedgewood Houston by our friend, Hollie Deese. Wedgewood-Houston is having a moment. 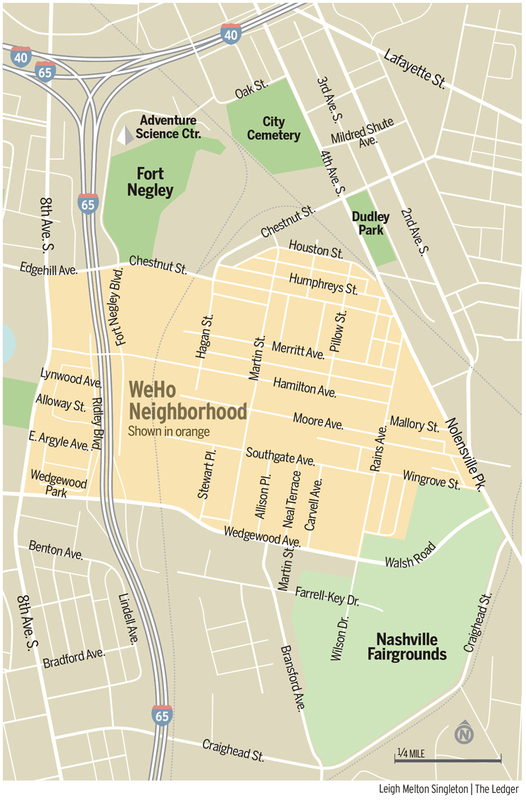 Once a South Nashville industrial area, nicknamed WeHo, it’s now an emerging neighborhood with local businesses, retail establishments, galleries and restaurants opening at a rapid pace. It’s catering to creatives, millennials, makers and local entrepreneurs. And it just got a major boost with Apple Music announcing the opening of an office in the neighborhood next year. There also is on-going development for The Finery, the addition of the Soho House Hotel and micro-unit housing recently approved by the Metro Zoning Board. Michael Dukes, 59, and Geoffrey Gill, 27, are owners of the new furniture emporium Royal Circus, one of the businesses that took the WeHo plunge. Open since August, the furniture store aims to provide shoppers something different than the typical showroom and give locals a place to meet for business and connect with the neighborhood. Dukes’ background is in advertising as a writer and a creative director. After years in Los Angeles making TV commercials, he moved to Nashville to pursue music while doing freelance advertising work. Gill is a Belmont grad who does large-scale fabrication work for architects and builds and designs furniture. The two met on a project when Gill was living and working out of a photo studio off Belmont Boulevard right down the street from where Dukes lived. Dukes was great friends with John Scarpati, owner of that studio. “So, we were looking hard and purposefully and using the best guy we knew of in town to do that, and had narrowed it down to two spaces,” Dukes says. But they weren’t exactly jazzed on either, despite both being great spaces. One was in East Nashville, but the neighborhood did not feel quite right for Royal Circus. The other was also in Wedgewood-Houston, but there were some issues ahead of them in turning it into what they needed. On a whim, Dukes joined a few people for drinks and was talking about their predicament. One of the guys also out for drinks happened to know a freelance leasing agent for Houston Station, Boyer Barner, and connected the two of them. The next day Gill and Dukes toured the location – two adjacent spaces in Houston Station, one the storefront and the other warehouse space behind with a loading dock, for a total of 5,800 square feet. Gill always thought the area should be in more of a destination space rather than a neighborhood like 12South that is crawling with tourists. 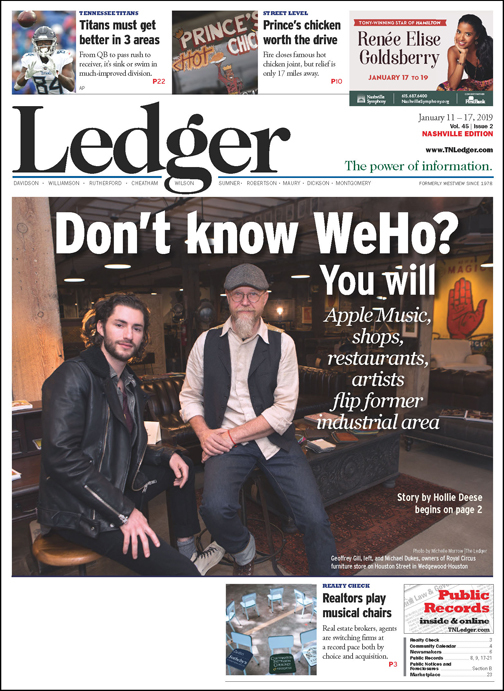 “We aimed to find more of an up-and-coming area that felt like it was still fairly local, but it was growing and had great potential,” he explains. “We wanted to be in the area that carries more of an artistic vibe to it. Houston Station, which is no longer here, but used to be a focal point of the neighborhood, was a big part of the community. Royal Circus is just one of many new businesses to crop up in the neighborhood in recent years. On Houston Street alone, Jackalope has moved most of its brewing from The Gulch, restaurants Bastion and Hemingway’s Bar and Hideaway have elevated the dining scene, and Americano Coffee is serving lattes to clients such as Tuck Hinton architects, who have moved in down the block. Elliott Roche, 27, is one of the founders of CoHub, a software development company that grew out of his father’s existing company, TapeOnline, which had been located on Logan Street off Thompson Lane for more than 20 years. They sold that building and moved into space in the old Houston Station building in August 2017, just before things really expanded in the neighborhood. They had considered 12 South and some more office-park locations, which they all hated. But Roche had been working out at Nashville Pilates Company in the same building for years and knew how the neighborhood was changing. “The Houston Station Building had a lot more to offer, just in terms of other businesses being around here and being a cool space,” Roche continues. “The walkability and the ability to go meet and entertain people at spots that weren’t just in our office was big.